The new Ghostbusters is officially a one and done deal. While there might be another movie sometime in the far away future, it definitely won't be starring Kristen Wiig, Melissa McCarthy, Leslie Jones and Kate McKinnon. Producer Dan Aykroyd doesn't blame them for the movie's ultimate failure, though. No. He places all the blame for this bomb squarely on director Paul Feig. Dan Aykroyd is actually quite mad at Paul Feig. And in a recent Sunday Brunch interview, the original creator of the series didn't hold back. He went on a mini-tirade that wasn't expected and left some shocked. After all, Aykroyd had championed this reboot all throughout production and during its promotional phase. One of the original Ghostbusters who starred in the 1984 classic, the comedian even came back for a cameo. And right off the bat he holds no ill will towards the newer movie's leading ladies. This is what he had to say about Paul Feig, whom he doesn't outright name, and why Ghostbusters: Answer the Call ultimately took a nose dive. "The girls are great in it. Kate McKinnon, Melissa McCarthy, Kristen Wiig, what a wonderful, wonderful players they are, and Leslie Jones. I was really happy with the movie, but it cost too much. And Sony does not like to lose money. It made a lot of money around the world but just cost too much, making it economically not feasible to do another one. So that's too bad, the director, he spent too much on it. He didn't shoot scenes we suggested to him and several scenes that were going to be needed and he said "nah, we don't need them". Then we tested the movie and they needed them and he had to go back. About $30 to $40 million in reshoots. So he will not be back on the Sony lot any time soon." This is the first time that reshoots for the movie have been named at costing upwards of $40 million. Which is quite a lot, considering some movies that made a lot more money in 2016 cost far less than $40 million to make. So, yes, however you want to look at it, the Ghostbusters remake is an outright bomb financially speaking, especially in the eye of Sony Pictures and Dan Aykroyd. 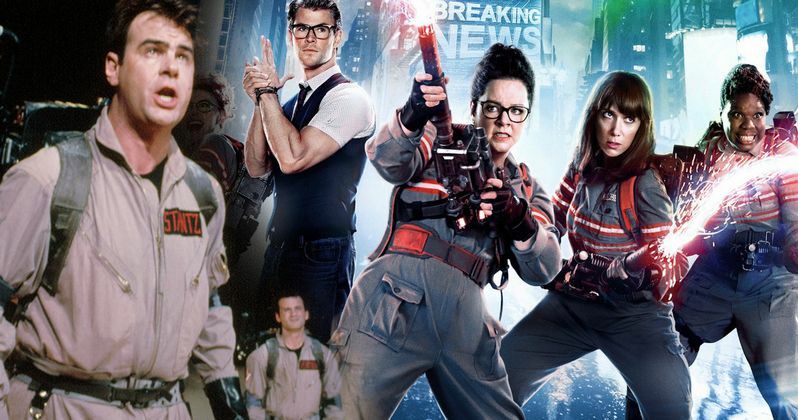 The movie had generated quite a lot of controversy prior to its release, primarily because it was being called an All-Female reboot, one that would not include, or even mention the original ghostbusting foursome. In fact, those guys never even existed in this universe, with the girls inventing proton packs to save New York from some angry spirits. When the movie came out, it generated mixed reviews, though the majority of them were positive. It finished its theatrical run with $229 million off a $144 million. When factoring in promotional costs, the movie is said to have lost quite a bit. Interesting to note, Dan Aykroyd's comments were edited down when Sunday Brunch was rebroadcast at a later time. In the short but brutal outburst, Dan Aykroyd doesn't ever waver on his original comments about the movie, which were quite positive. He doesn't outright call it a lousy piece of cinema. It's Paul Feig that is firmly in his crosshairs. And it's clear that Paul Feig won't be allowed anywhere near the Ghostbusters franchise again. His presence on the Sony lot is a little less unclear. While there is no sequel to Ghostbusters: Answer the Call on the horizon, there is a new animated movie in the works. It is said to revolve around four male scientists in New York once again battling a threat to the city. It isn't known if the original characters are making a return, and any progress on the project has been relatively quiet. Dan Aykroyd did not mention the cartoon in his appearance on Sunday Brunch. There was a seventeen year gap between 1989's Ghostbusters 2 starring the original crew and this latest redo. The way Dan Akroyd makes it sound, it could be another 17 years before we see another live-action movie. Perhaps a TV show is in order to save this franchise?